Below are ten critical observations on the ever-deepening crisis that has engulfed the Gaza Strip for over a decade now. 1. Three years after the war, the main underlying factors that brought all aspects of life in Gaza to a near breaking point on the eve of the last war—namely, the suffocating Israeli blockade, now entering its 11th year; the intra-Palestinian political rift; and the prolonged closure of Egypt-controlled Rafah crossing—continue to wreak havoc and cause mounting hardships. Worse, post-war attempts to give Gaza a breathing space all failed to provide the much-needed respite: donor-funded reconstruction, despite reported progress in the rebuilding of destroyed houses and infrastructure, is still running behind schedule; reconciliation talks to bridge the Palestinian chasm are going nowhere; and the Palestinian Government of National Consensus (formed just few weeks before the war) is still unable to govern in Gaza. Hamas, on the other hand, despite its current political and financial misfortune caused mainly by changes in regional political dynamics, is still in de facto control in Gaza. 2. Donors are still not fully delivering on the pledges made at the October 2014 Cairo Conference on Reconstructing Gaza three years after the war. Israel continues to restrict/delay the entry of the much-needed construction (and other) materials through its application of the vaguely-defined “dual-use list” system, where a large number of goods are viewed as having both civilian and military use. The largely inefficient and much criticized Gaza Reconstruction Mechanism—brokered by the U.N. to facilitate post-war rebuilding—had made rebuilding efforts more complicated. By the end of 2016, the latest data available suggests that only half of the $3.5 billion donor pledges have been disbursed, with close to two-thirds of the disbursed funds allocated outside recovery and reconstruction plans as defined by the $3.875 billion Palestinian government’s Detailed Need Assessment program. As a result, the program remains grossly underfunded. Today, 33,000 people who had their homes totally destroyed by the war continue to be internally displaced, and over 6,700 of severely destroyed houses still lie in ruins. 3. The statistics on socioeconomic conditions in Gaza are very bleak and alarmingly troubling. More families are languishing in poverty which currently consumes 39 percent of the population, increasingly becoming food insecure, and relying more and more for their basic survival on foreign handouts which at present sustain 80 percent (or 1.6 million) of Gaza population. More adults, especially the educated youth, are joining the already long unemployment lines, desperately looking for jobs that do not exist. At 41 percent overall jobless rate, with youth unemployment estimated near 60 percent, the situation is extremely precarious. More worryingly still, international efforts to sustain the unsustainable in Gaza are proven difficult to succeed, with conditions deteriorating at a much faster rate than the ability of donor funds to halt their downward spiral. 4. Basic infrastructure in Gaza is currently on the verge of a total collapse. Power blackouts are hovering around 20 hours a day due to largely-politicized electricity shortages that severely disrupt the provision of all vital public services, and further frustrate the recovery of an economy buffeted by three wars and a devastating blockade. Over 95 percent of groundwater in Gaza is unfit for human drinking, and is only available for six to eight hours every three to five days. Approximately 110 million liters (110,000 cubic meters) of raw and partially treated sewage are poured daily into the Mediterranean Sea, contaminating 73 percent of Gaza’s 42 km (26 miles) coast. Donor-funded projects to rehabilitate Gaza’s crumpling infrastructure are routinely delayed, either due to insufficient funds or to problems emanating from continued Israeli restrictions on the entry of technical experts, essential equipment and parts; or both. 5. Gaza’s two million people, meanwhile, are growing annually by 3.3 percent. Over 65 percent of the population is under the age of 25. Its labor force is increasing by 4.5 percent a year, with an estimated 35,000 young adults entering annually the job market; a number that is expected to go even higher each year due to the young nature of Gaza population. The economy, however, is not creating jobs, and has been virtually stagnant since 2006; with average annual real G.D.P. growth over the 2006-2016 period not exceeding 1.44 percent. Real per capita income in Gaza, as a result, has been on a declining path since 2006. Output growth of at least five percent a year is thus needed just to absorb the new entrants to the job market. More G.D.P. growth will be required to reduce chronic unemployment, recoup lost income, and improve standards of living. 6. Gaza’s private sector where jobs and income should be created, however, is currently incapacitated due to a crippling decade-long blockade, and the losses sustained during the war that caused extensive and widespread damage to its productive assets. Furthermore, one-third of Gaza’s farm land, and more than half of its Oslo-agreed fishing waters—both are unilaterally declared by Israel as no-go/risk zones—are still off-limits to Gaza economic use. Severe restrictions on imports and exports have driven some Gaza firms out of business, forced others to relocate to neighboring Arab countries, while those that remained open are operating well below capacity. Isolated and cut off from supply chain, their fight to stay in business is compounded by chronic deficits in electricity, fuel, and water supplies, and by an odd regulatory environment caused by the decade-long internal Palestinian political split that looks increasingly permanent with each failed round of reconciliation talks. 7. Three years after the war, only 3 percent of the estimated $602 million recovery needs of Gaza’s private sector have been met; a sum that is too meager to launch the desperately needed economic upturn which remains an unattainable goal. Under Gaza’s excessively harsh conditions, long term development is not even on the map. Worse still, incremental stopgap international interventions to save what remained of Gaza businesses after years of continued decline are hardly making a tangible dent in Gaza’s private sector’s grim conditions, except perhaps to maintain their basic survival, and to prevent or delay a total collapse of the battered economy. 8. Three years after the war, thus, Gaza remains a war-torn territory; a man-made disaster; an open-air prison, isolated and besieged from all sides. Its economy is crushed; its two million people are traumatized and abandoned; and its civilian infrastructure and basic services, both social (mainly healthcare and education) and physical (energy, water, and sanitation) are largely dysfunctional. For years, the international community has been providing Gaza with vital humanitarian assistance in an attempt to mitigate the continued worsening of socioeconomic conditions and to help Gaza’s trapped and impoverished population survive their predicament. And yet, crucial as foreign aid has been, Gaza living conditions continue to deteriorate much faster than expected, as the latest U.N. report made clear. 9. To pull Gaza back from the abyss, a fundamental change in policy is now urgently needed to address Gaza’s deepening calamity; a new approach within which the short-term intervention measures, humanitarian or otherwise, represent only one component, not the whole gamut. In this alternative holistic approach, Gaza needs to be looked at as a strategic development project, not as a humanitarian burden. Given the scale of Gaza’s ongoing predicament, continuing with the current failed approach is no longer possible, and will only lead to more hardships (read: higher unemployment, poverty, and food insecurity rates; more failing infrastructure; dwindling quality of basic social services, including education and healthcare; continued environmental degradation; and deepening institutional decay) with wider serious consequences on all fronts. 10. For any new approach to succeed, however, the overall political setting related to the Gaza question must be resolved, and the right conditions for recovery and long term development need to be put in place. Without this, nothing of a lasting positive impact can ever be achieved. Yet, very little has been done so far to address the underlying political/structural root causes of Gaza’s continued misfortune (namely, the crippling Israeli blockade and the decade-long intra-Palestinian divide); and the prospects for that to happen any time soon do not look promising, either. Fast forward a few years down the road, trying to predict the future of the Gaza Strip under unchanging political conditions is certain to be an extremely unpleasant exercise. And when the U.N. is already warning of an impending implosion, then time is quickly running out—in fact, it has already run out. That should give all those with high stakes in the future of the embattled Palestinian coastal enclave, including the Palestinians themselves, a moment for a serious and moral pause. Unfortunately, we are not there yet. This article is based on a new report by the author, which was commissioned by the U.N.D.P.’s Program of Assistance to the Palestinian People. 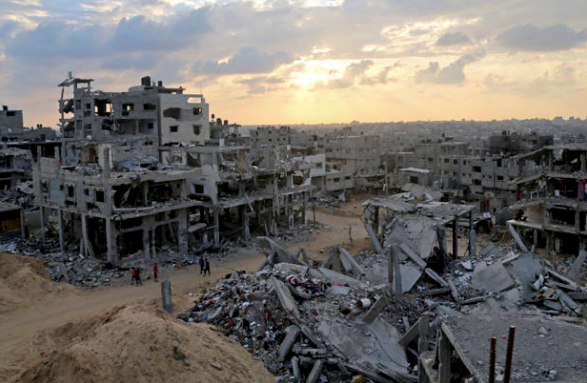 The report is titled: Beyond Survival: Challenges to Economic Recovery and Long-Term Development in the Gaza Strip.